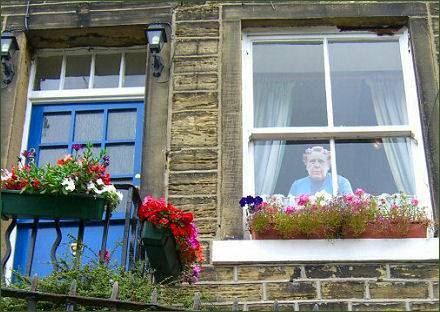 The highly attractive West Yorkshire market town of Holmfirth, known locally as 'Little Hollywood', is the setting for the BBC's long running comedy series Last of the Summer Wine. Thousands of tourists visit the town every year to see the locations familiar in the series, such as Sid's Cafe (pictured left) and Nora Batty's famous Steps and to enjoy the superb surrounding scenery across the Holme Valley. 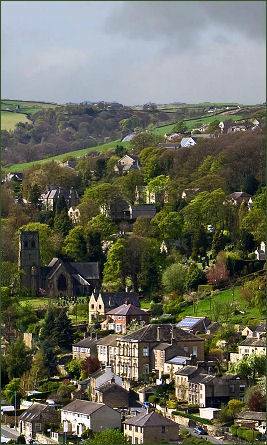 Holmfirth is a small town situated in Kirklees, in the Pennine Hills, it is situated at the confluence of the Holme and Ribble rivers, 6 miles (9.7 km) to the south of Huddersfield and lies on the doorstep of the Peak District National Park. The town originated around a corn mill and bridge in the thirteenth century. Anciently referred to as 'Holm Frith', the word "Firth" is of old English origin and means woodland, indicating the name means Holme woods. During the sixteenth century Holmfirth expanded rapidly mainly due to the growth of the cloth trade. Local quarries later produced stone and slate which also enabled the town to flourish. The small and characterful town has many terraces of stone-built cottages which are typical of this area of West Yorkshire. Narrow, steep alleyways, known locally as "ginnels", provide short cuts between the former weaver's cottages. Sid's cafe, used in the 'Last of the Summer Wine' stand's opposite the parish church. The church dates to 1778, a previous church which occupied the site was built in 1476 but swept away in a disastrous flood in 1777, when the River Holme burst its banks during a thunderstorm, resulting in the loss of 3 lives. Next door to Nora Batty's famous steps (below left) is a tearoom which serves teas and snacks from what was Compo's bedroom in the TV series. Th'owd Towzer, situated behind the church, dates back to 1597. The tower acted as a lockup however it has had many other roles in the past, including an ambulance station, a jail and a fire station. Holmfirth was once the home of Bamforth & Co Ltd, who were well known for their cheeky seaside postcards, which are now quite collectable. Their printing works on Station Road has now been converted into residential flats. Bamforth's company were early pioneers of film-making, before they abandoned the business in favour of postcards. 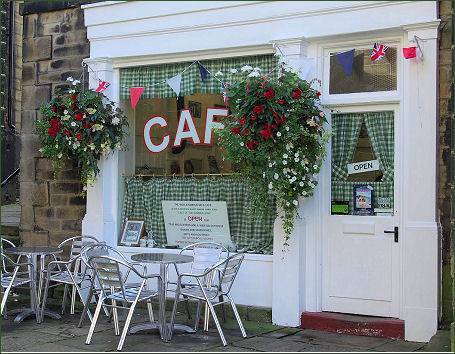 Holmfirth contains a wide range of book shops, gift shops and eating places, including restaurants, wine bars, pubs, take-aways and caters for a wide variety of tastes. The vintage tour bus takes visitors to the town along the hilltop roads above the valley to see some of the stunning Pennine locations used in filming the series. Holmfirth Vineyard is set in 7 acres overlooking the picturesque Holme Valley, with a purpose built visitor centre and a newly opened restaurant. vineyard tours are available with wine tasting, an onsite shop and adopt a vine programme. Holme Moss Moor, on the border between the High Peak district of Derbyshire and Kirklees lies around 4 miles from Holmfirth.The moor rises to 1,719 feet (524 matres) and is just inside the boundary of the Peak District National Park. The Holme Moss transmitting station on the moor is the highest in England. Holmfirth Festival and the Festival of Folk are held in the summer. The Music Festival is held in October and every July there is a Duck Race on the river.